Romain Grosjean has become the first back-to-back Driver of the Weekend winner since 2014. The Haas driver?s combative run to fifth place in the Bahrain Grand Prix was widely admired, though he won a much smaller share of the vote than after taking the team?s breakthrough points finish in Australia. With 39.4% of the vote, Grosjean became the first winner of consecutive Driver of the Weekend polls since 2014. 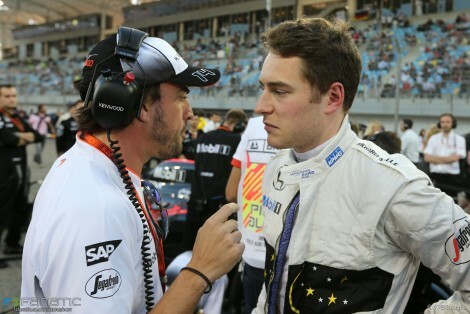 But the performances of other drivers including rookie Stoffel Vandoorne also caught your eye during the Bahrain Grand Prix weekend. Haas took on the top teamsUnlike Australia two weeks ago, Haas and Grosjean showed strong pace in practice and from the off it looked as the new outfit could potentially challenge for a spot in Q3. But as it happened he was pleased to lose his spot in the final shoot out to Nico Hulkenberg meaning he could start ninth on a fresh set of tyres. A clean start saw Grosjean jump from ninth on the grid to sixth at the end of lap one at the expense of Sebastian Vettel, Lewis Hamilton and Valtteri Bottas. 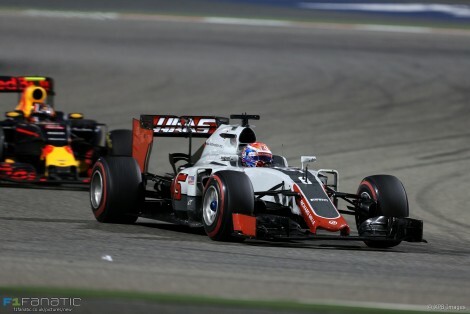 From there Haas ran an aggressive strategy to keep Grosjean in touch with the faster cars. Three stints on super-softs followed by a soft stint to end the race meant Grosjean was almost always appearing in someone?s mirrors. He managed his tyres well and managed to run as high as fourth at one stage in the race. Well-executed passes on the likes of Felipe Massa and Daniel Ricciardo put smiles on the faces of the Haas team who surely never expected to be racing the likes of Williams and Red Bull so soon. Three stops was a brave strategy for a team who?d never done a racing pit stop before and the inexperience showed. But with Grosjean finishing 16 seconds behind fourth-placed Daniel Ricciardo, it?s doubtful it cost him a better finish. Fifth place without the aid of the mid-race interruption seen in Australia was an impressive achievement. Have to go with Grosjean because of the super aggressive super-soft tyre strategy that propelled him to fifth place. He was able to take great advantage of overtaking in order to keep the strategy alive. I am going with Grosjean again. Sure, the car may be a bit better than we thought it was in Australia, but he still had to make the strategy work and that meant being super agressive and not killing the Pirellis. He made all the important passes and managed to stear clear of any mistake. I love the fact Grosjean is living the dream there at Haas. If anyone deserves it is him. However, without taking any credit away from him or his team, I get the feeling he winning this poll again due to the fact everybody expected to have a new Manor, HRT or Catherham. The truth is though, that Haas is simply unbelievably quick. Probably the fourth or fifth quickest car behind Mercedes, Ferrari and Red Bull this weekend and I would say on par with Toro Rosso (see also how quick Gutierrez was before he had to retire). Vandoorne impressed in Alonso?s carSecond in the standings this week with just over 25% of the vote was Stoffel Vandoorne, who picked up one point in his maiden race. Pascal Wehrlein also showed well in the poll with just over 10%. It has to be Vandoorne. No testing, flew in overnight to shock the establishment. Beat Button on qualifying, which is not that special anyway. First weekend, clean start, clean race, and a point which is more than McLaren could deliver. Wehrlein anyone? That?s where my vote went, lightning in qualifying and took it to both Sauber and Renault in the race in his little Manor, he was excellent. Ricciardo picked up surprisingly few votes after a strong qualifying lap and another emphatic victory over his team mate. And the Force India pair of Nico Hulkenberg and Sergio Perez received not a single vote between them after early incidents ruined both of their races. It was a disappointing race for the team at a track where the car should have been strong. Yeah I think he?s (Ricciardo) gone under the radar a bit, but he?s definitely getting the maximum a driver could from that car. In DOTW, is there a requirement to vote only for drivers who have participated in the race? I, for one, would like to vote for Alonso as the DOTW, for his sick burn into the face of Johnny Herbert. Doctor Who Series 9: Who Are The Hybrids And What Does It All Mean?